Update: A friend suggested I add some balsamic vinaigrette as well. I'll try it and report back how much I used. *optional: whatever fresh vegetables you have in the fridge, chopped. 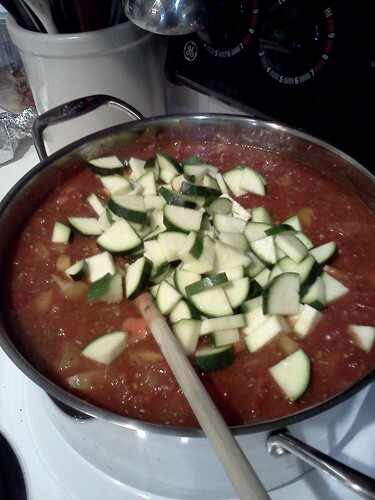 I like peppers and zucchini in particular. Sautee the garlic and onion in a medium pot until the onion is a bit transparent. Add everything else in, bring to a boil then reduce heat to low and simmer covered for at least 15 minutes. The longer you simmer, the better the flavors will blend. 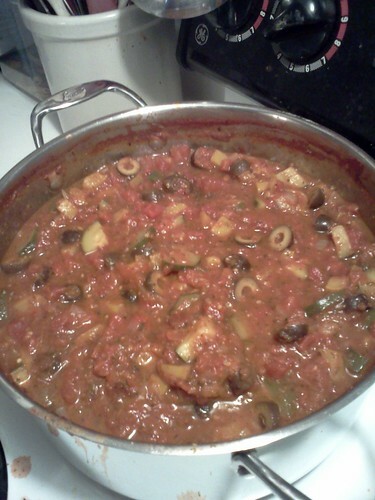 I've simmered for a couple of hours. And now for some pictures from Saturday. 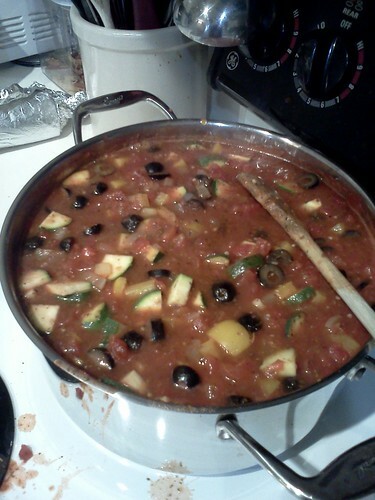 I think these pictures represent around 6 times the regular recipe plus I added in 2 medium zucchini, 2 large (ok, huge) yellow peppers and 2 cans of sliced black olives. And when I say I let it simmer, I mean I let it simmer for HOURS . . . I think in the end it was on the stovetop for around 8 hours. The house smelled amazing and the flavors really blended well. I'll be using this sauce in some lasagnas I plan to assemble (going to try my hand at homemade ricotta cheese this week too) as well as freeze it in family-sized servings to be served over our favorite boxed pasta. Stay tuned for more recipes as I share tales from my freezer stock up mission. I went on Saturday. Quite honestly, I wasn't overly impressed. I will say this though, everything was well organized and the aisles were well maintained and not crowded like they are at Michaels (which is a nightmare to take Snickerdoodle to). I was disappointed to find out they'll only take one coupon per visit (even if they have different codes) which will probably mean that JoAnn wins out for my business when I have to pick between the 2 stores. I'm glad I went though, I like knowing what my options are.